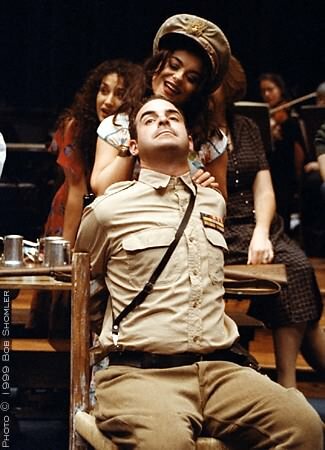 Nicolas Aliaga as Zuniga with Marla Kavanaugh as Frasquita in Carmen. Nicolas Aliaga Garcia moved to the Bay Area eighteen years ago to begin his operatic career after graduating from Tufts University in Boston. Since then, he has performed roles with many companies including Opera San Jose, Pocket Opera, Festival Opera, Berkeley Opera, Oakland Lyric Opera, Oakland Opera Theater, Boston Publick Theater, The Jarvis Conservatory, The Lamplighters, Theatreworks, Golden Gate Opera, and San Francisco Lyric Opera. He also toured for six months in Switzerland singing with a classical/jazz quartet, and worked for three years as the Education Associate for the San Francisco Opera Guild. He began his directing career with one-act operas for Pocket Opera (Bastien and Bastienne, The Cat Who Became a Woman, Dr. Miracle, The Wedding Roast), where he went on to direct La Belle Helene, La Traviata, Cavalleria Rusticana, Abduction from the Seraglio, The Tales of Hoffmann, Romeo and Juliet, The Magic Flute, The Pearl Fishers, and The Merry Widow. This season he directs Don Pasquale, Pagliacci/My Fair Galatea, and Cosi fan tutte. Mr. Aliaga directed Stravinsky’s Soldier’s Tale under the baton of Kent Nagano for the Forest Hills Musical Days Festival. He was the assistant director for Les Pecheurs de Perles at Michigan Opera Theatre and has worked as an assistant director at San Francisco Opera Center. Mr. Aliaga has been an assistant director at Opera San Jose for Barber of Seville, Pagliacci, La Voix Humaine, La Traviata, Les Pecheurs de Perles, and Italiana in Algieri. In 2013 he directed Gianni Schicchi and Puccini: The Man and His Muses for Sacramento Opera. Most recently, Mr. Aliaga worked as the Assistant Director at San Diego Opera on productions of Madama Butterfly, Great Scott, and La Cenerentola and will return there this season for Le Nozze di Figaro. In 2017 he worked at the Royal Swedish Opera House (Kungliga Operan) assisting Lindy Hume on her production of Cenerentola. He has been the Cantor at Old Saint Mary’s Cathedral (California’s first cathedral) since 1996. Copyright © 2019 Nicolas Aliaga.